Toronto Maple Leafs goaltender Curtis McElhinney, Columbus Blue Jackets forward Pierre-Luc Dubois and defenceman Ryan Murray will join Team Canada for the upcoming World Hockey Championship in Denmark next week according to TSN's Darren Dreger. Team Canada adds for Worlds Hockey Championship: McElhinney- Leafs, Dubois- Columbus, Murray- Columbus. 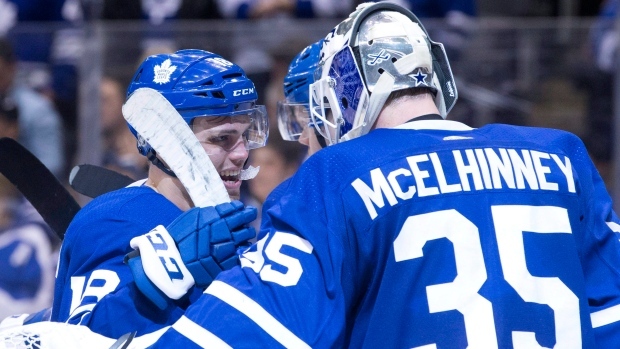 McElhinney impressed for the Leafs in limited action this season. In 18 games, the 34-year-old was 11-5 with a 2.15 GAA and a save percentage of .934. Dubois is coming off a breakout rookie season with the Blue Jackets, in which he scored 20 goals and added 28 assists. He last wore the Maple Leaf at the 2017 world juniors. Murray won gold with Canada at 2016 worlds and will be playing at the tournament for the third time in his career. The 24-year-old had one goal and 12 points in 44 games with the Blue Jackets this season. Cam Atkinson (USA), Dean Kukan (Switzerland), Markus Nutivaara (Finland), Alexandre Texier (France) and Matiss Kivlenieks (Latvia) will also be representing the Blue Jackets at the worlds, which begin on May 4.